This book argues that serious misreadings of Freud and Lacan on sexual difference have characterized prevailing models of psychoanalytic film criticism. 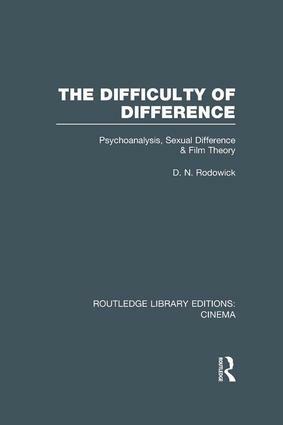 In critiquing theories of identification and female spectatorship, the author maintains that early film theorists and feminist critics are equally guilty of imposing a binary conception of sexual difference on Freud’s thought. By embracing such a rigid definition of male/female difference, they fail to understand the fundamentally complex and fluid process of sexual identification as it is articulated in Freud’s writing, constructed in film texts, and negotiated by spectators. The book turns to Freud’s work on fantasy to develop an alternative model for interpreting sexuality in the visual and narrative arts, one that emphasizes a ‘politics of critical reading’ over accepted theories of ideological identification. Originally published in 1991, its strategic focus on psychoanalysis itself as an object of historical and critical inquiry, and not simply as a reading method is the unique quality of this book.